I found this interesting. I rarely fish flourocarbon…I have always liked mono/nylon better. anyway the guy talks about fullers earth and i had never heard of it…anyone use it? I noticed some companies make it at a cost but this guy makes his own. Seems like it would be a good thing. I remember in the Oz series the footage of tippet creating light and shadow patterns when it floats. Prism kind of stuff made from water and tippet. For spooky trout removing that extra visual noise may be the difference between catching and not. Fullers earth has been superceded by all the various chemical sinkants that are available now. For many years I have always either picked up some earth from the bank and rubbed the mono leader with that. It takes off the ‘gloss’ and makes it sink. Crushed grass/vegetation will achieve a similar effect. Mono v Fluo - in my book very much a personal thing. In my Western style fly fishing years (approx 40+ years) I always used mono with no complaints. In the early days fluorocarbon was relatively new and very expensive! Certainly here in the UK. However since I have ‘returned’ to fly fishing after a few years break, I am now a fixed line fly fisherman only and have started to use fluorocarbon. I am not sure whether I will continue as I prefer the feel of mono but I want to see how much difference (if any) it makes to my fishing. I was reading recently that most of the American fly fishing guides use mono. Also I note that @CM_Stewart uses mono too. That is pretty good recommendation in my book for mono. Hahaha. Its a cycle Adam…a cycle. For me i had never heard anyone put it the way the autgor did…noting the hogwash. A lot of our peers fish flouro. I even own sone…if people like it then thats great but for me i will probably always use nylon. Seems like fullers earth is old tech but new to me. I am gonna goof around with it. I almost… almost want to say I don’t like Floro, I don’t see it as well, so I don’t cast it as well. Even though it’s heavier I was taught to watch the cast to see what I’m doing wrong ( more wrong than right at that time) so I really learned a lot about my casting errors by watching the line. I see mono, even transparent, I see better than hi vis floro. The guy who taught me tenkara almost exclusively uses stren hi vis 12lb mono. It is fantastic and one spool will last a lifetime. It is fantastic and one spool will last a lifetime. I like fluorocarbon. I am making full lines out of premium clear fluorocarbon for spooky educated tailwater trout in slackwater. These trout are line shy having seen lots of spin fishers ripping spoons and spinners through them. But I am catching them with muted clear fluorocarbon. Next time, clear invisible mainline and tippet. That will help. More importantly that fluorocarbon or nylon, make your own lines out of what ever you want. That skill is way more important than being marketed to. 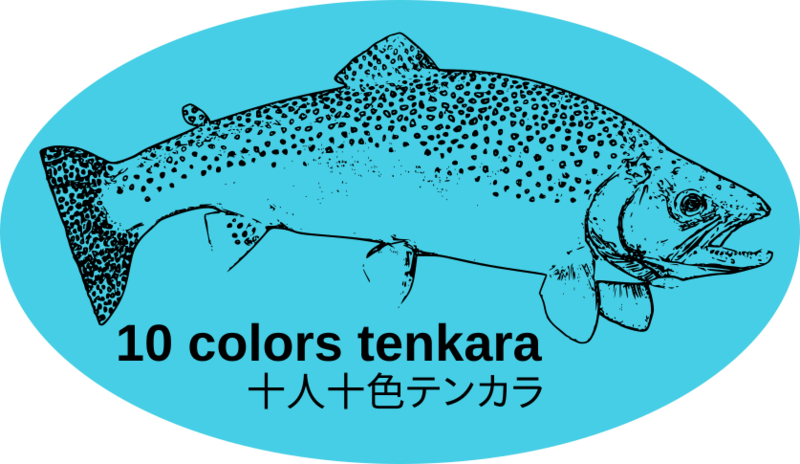 Do not hesitate to experiment with what you want to use, nylon or fluorocarbon, spectra, gelspun, kevlar or any one of the new materials available that will work for a tenkara line. When it comes to old arguments, what comes around, goes around. Like that old saying, “If you do not learn from history, you will be doomed to repeat it.” Or something like that. I was speaking mostly abput tippet. The differences in castingling line are more of a casting prefernce than a visibility one for me. I just feel that they can factor less depending on the nature of the water i fish. The authors note on flouro vs mono and how out of the box they may both float are things i am keying in on. Goto time 48:40 here to see what i mean.